You don’t have to be in the special forces to know how to knock out 100 pushups in no time. Training to bang out 100 in one sitting will give you awesome upper body strength and endurance…..not to mention, that’s pretty impressive. Let’s go over a few training methods that are specific to this goal. The first, and most obvious thing that you need to do is…..well, pushups! To be a great free-throw shooter in basketball, or field goal kicker in football, you simply have to get in the repetition. It builds muscle memory and conditioning. At least one day out of the week, part of your workout should consist of 10 sets of 10 pushups. Be very deliberate on every repetition. Rushing through the reps will take away from the effectiveness of the workout. When you first start off, take plenty of time to rest in between each set. Keep track of how much time you need between every set and decrease it each week. The bench press is an effective way to simulate the motion of the pushup, while being able to add weight. You should hit this exercise once a week, but make sure you space it out from your 10×10 pushup day. When you first start out on this mission, pick a weight that you can do for about 3 sets of 12 reps. As you march through the weeks, gradually increase the number of sets and decrease the number of reps.
For example, the second or third week you can increase it to 4 sets, and decrease the rep count to 8. Since you’re doing less reps you can add some weight. Eventually you’ll get to 5 sets of 5 reps with a pretty intense weight. Some people have a really strong chest, but lack in the endurance department. If that’s the case with you, try doing a drop set. That means when you’re on your second-to-last set, you’ll decrease the weight to about half of what you were just doing…..and knock out as many more reps as you can with no rest (except for the weight change). For example, If you’re doing 4×8 with 185 pounds……as soon as you’re done with the 3rd set, drop the weight to about 95 pounds for your last set. But you have to get as many reps as you can (try to at least get double of what you where initially doing. In this case that’s 16.) with no rest in between. Pushups aren’t just a chest exercise. You’re triceps are a secondary muscle that will help lock out your elbows, especially when fatigue starts to set in. 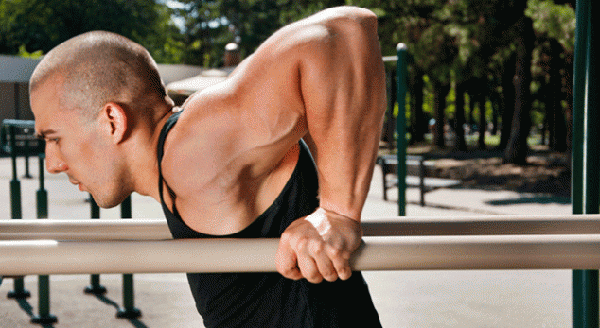 One of the best ways to develop your triceps is by doing chair dips, or chair dips. Keep these at about 4 sets and a high number of reps (between 12-25). You can do them on the same day that you do the 10×10 pushups, or the bench press day. They should be done at the end of the workout. If you implement these specific exercises and rep counts into your workout, you’ll be able to knock out 100 pushups in no time at all. I hope you enjoyed this article and found it informative. Please take a second to share it on facebook. Another article that you’ll probably like is…Get Ready To Train Until Failure.